Our go-to drink for our Greek week, a Mojito. Fresh mint tastes a little more marvelous while overlooking the crystal blue waters of the Aegean Sea. Our server for the week at Danai Beach Resort and Villas (The Leading Hotels of the World), Anastasia. Day after day, at the moment when we need to catch our breath, we'd slide onto the beige colored cushy-couches of the outside bar (totally vacant of patrons due to the end of the tourist season) just inches from the sand and exhale as our eyes lock on the still waters straight ahead. As soon as she sees us, Anastasia brings nibbles of nuts, and within minutes, our Mojitos accompanied by her electric smile. This is our afternoon for three days. In the evenings, we'd walk out of our suite, take 50 steps, and enjoy award-winning meals at one of Danai's onsite restaurants. The Andromeda Restaurant (2016 FNL Award for Best European Kitchen) served fresh Mediterranean cuisine on white china to the soundtrack of the Aegean Sea lapping at the shores. Elegant. Timeless. Breathtaking. It's one of those spaces where you pinch yourself and wonder if they have mistaken you for someone else or they took this turn by mistake. As marvelous as the food is but feeling way out of our league, we opt for The Sea Horse Grill for our remaining nights, located across the walk-way supporting the same view and the same ocean breeze with a little less flair. This is who we are. A luxury resort that accommodates all tastes is a win-win for everyone. However, no matter in which restaurant we dine, like clockwork, the sommelier appears with our first decision for the evening. We'd decide on our meal, and let him do the rest. The first night, our red wine complements our bolognese perfectly. The next night, our pairing (Macedonia's Estate Pavlidis) was even better than the first. Never considering ourselves wine aficionados, we lean on the experts to direct our path. And it wasn't until our experience with wine at Danai did we truly appreciate the complexity of pairings . . . and the ability of getting it right. Before the rush of the evening meal and during our last afternoon at Danai, we meet Apostolos Plahouras, head sommelier for the resort. 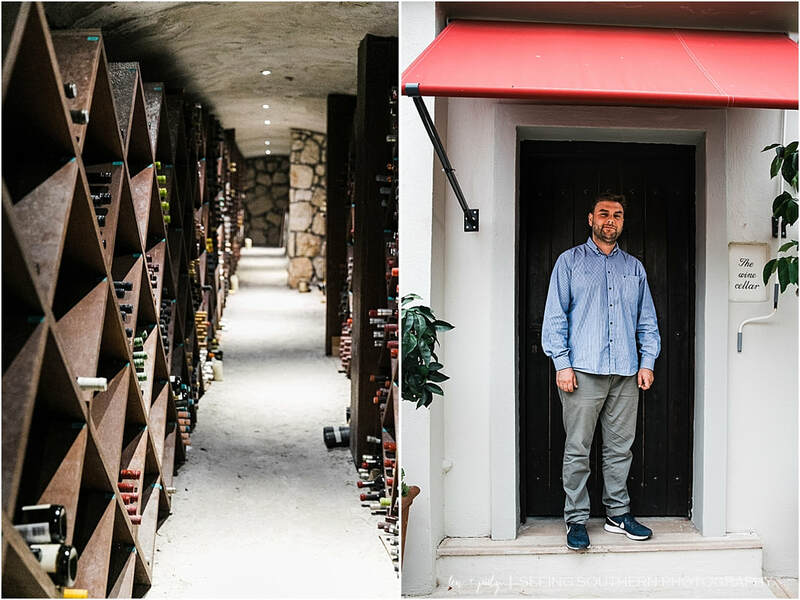 As we walk with Plahouras through the unpretentious door into his cellar strategically located near each of the restaurants, we feel the temperature immediately drop. At a year-round temperature of 16 degrees centigrade with a relative humidity of 72 percent, he celebrates his old style of cellar, a "true cellar" for aging wines. 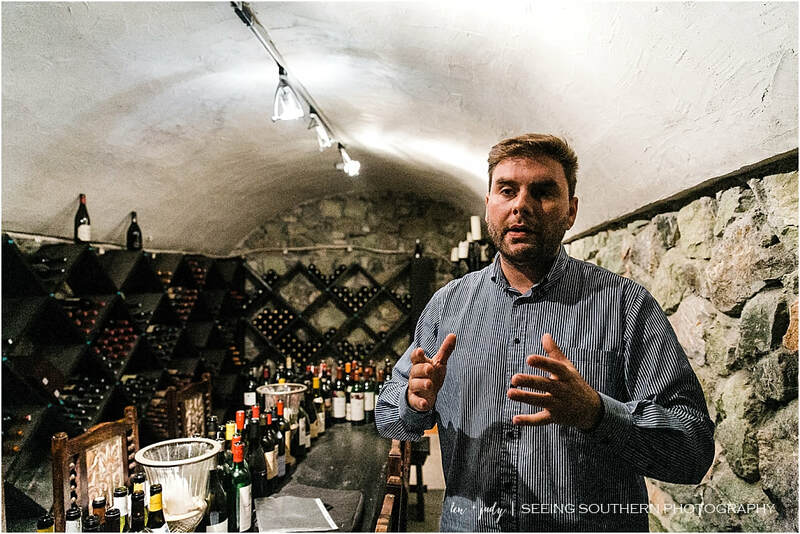 In addition to offering an extensive collection of wines from all over the world, it is "most important to educate and promote knowledge, “he says. "It promotes good choices [for the] rest of life." 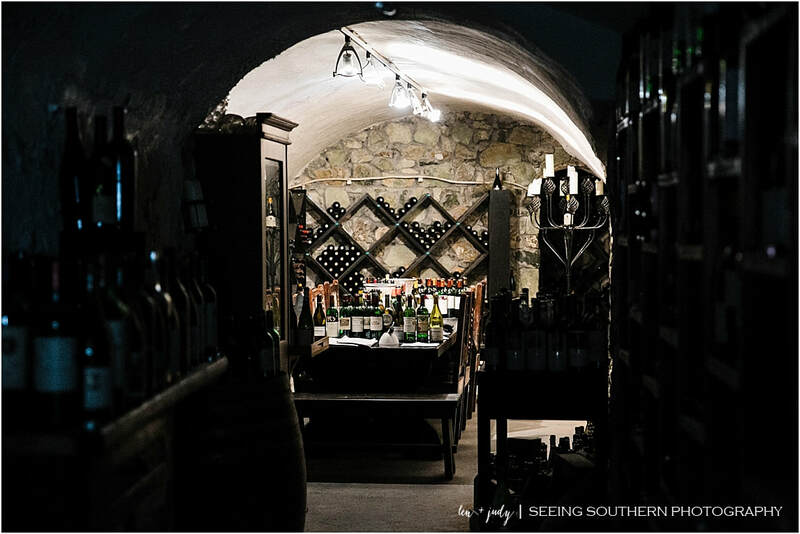 With four sommeliers on staff, the resort conducts educational seminars and wine tastings throughout the season, opening the door of the cellar and introducing guests to earthen walls stacked head-high with dusty bottles and dimly lit passageways leading to caverns with more of the same. On this date in 2018, the oldest bottle reaches back to 1907. Varieties are brought in from all over the world from estates that produce the best vintages. It takes him seven years to replace his best wines, and the team is always seeking the rarest of wines. "We follow these roads to get more and more every year, and we make the biggest effort we can." Plahouras's beginnings with wine happened purely by accident. At 18, he entered his first job in the restaurant business, and he began asking himself, "What kind of job is this? So stiff." Immediately, the three of us chuckle as we realize we are standing in one of Greece’s finest cellars with a variety of exceptional vintages and speaking to one of the world’s leading authorities on wine who stands with us in his jeans and electric blue tennis shoes. Through a series of lifetime failures and successes, he now leads the team at one of Northern Greece’s most luxurious resorts located on the middle peninsula (Sithonia), referred as one of the "three fingers" of the Halkidiki peninsula. Offering one of the largest selections of wines in Greece has put Danai at the top of the tourism ladder at being the best at what they do. "You please guests," he responds to their notoriety. "You must always. For me, it's not the title but the road." After working in this business for over 14 years, it's emotion that drives his passion. "It's the emotion of what you do. You must grab the emotion. Everything happens when you open a bottle. It's like a good moment with good company, the anesthesia, the happiness, the friendship, the smiles, it happens when you open a bottle," he smiles, and then concludes, "I speak scientifically." Their ultimate goal is to please guests. As the collection changes and meets the market needs, they are happy that they don’t let fads or trends determine their choices. Of all the sommeliers, in all the wine cellars, in all the resorts, in all the world, passion and emotion never crafted words and intentions as they did with Apostolos Plahouras. The love of a good wine, at least for this traveler, has always been defined by taste rather than knowledge. At Danai, the marrying of taste and knowledge is an objective that isn’t lost on anyone who dines here. It reaffirms our notion that enjoying a good bottle of wine in good company and learning of its origin can go hand-in-hand; the experience can be for every man. And it’s especially memorable when relayed by a guy in electric blue tennis shoes. To book your stay at Danai Beach Resort (seasonal April - September), visit its website. To learn more about the region of Halkidiki, visit its website.